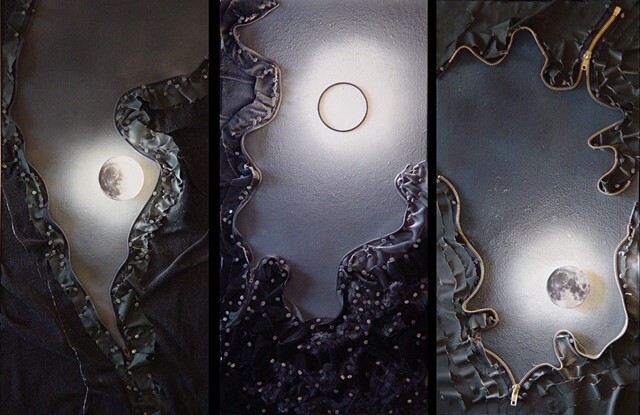 The Night Window series, Night Clouds series, and Moonrise Rift series explore images of the darkened sky as seen by the naked eye and as revealed by the unconscious mind at night in dreams: sometimes the sweetly poetic and sometimes the omnia noctis (omens of the night). Some content reflects natural phenomena: the sky dense and black with the moon hidden by clouds, the moon emerging and shattering the blackness, the moon illuminating night clouds. The gentle glow of the moon tears and tatters the fabric of night and floods my room with silver. Mixed Media: mat board, acrylic, graphite, tape, push pins, fabric, dressmaker’s pins, map, pins, plastic rings, corrugated cardboard, metal finding, moon image from NASA/courtesy of nasaimages.org on canvas panels. Mixed Media: spray paint, cardboard, Prismacolor pencil, fabric, carpet tacks, moon image from NASA/courtesy of nasaimages.org on canvas panels. 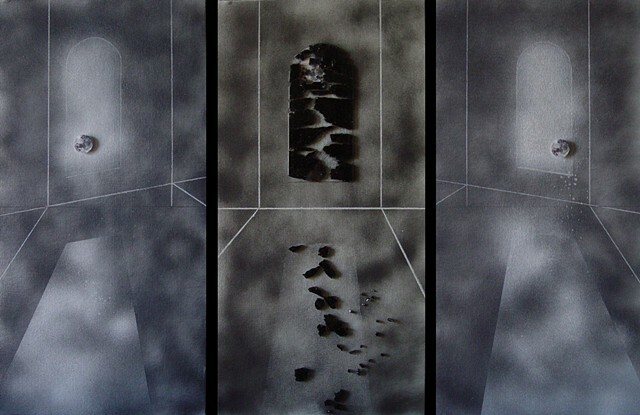 Mixed Media: spray paint, graphite, cardboard, Prismacolor pencil, shattered glass (Betsy’s left rear window), moon image from NASA/courtesy of nasaimages.org on canvas panels. 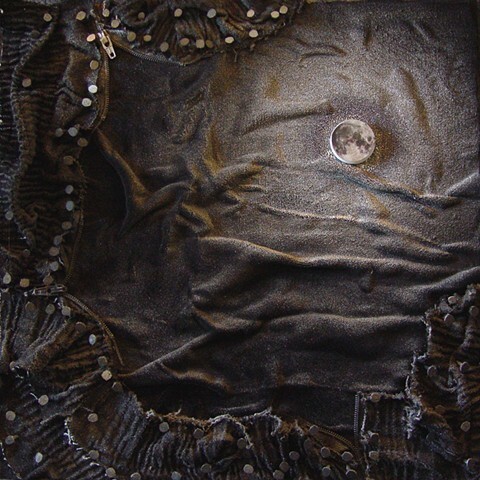 Mixed Media: fabric, cheesecloth, spray paint, map pins, dressmaker pins, ping pong balls on canvas panels. 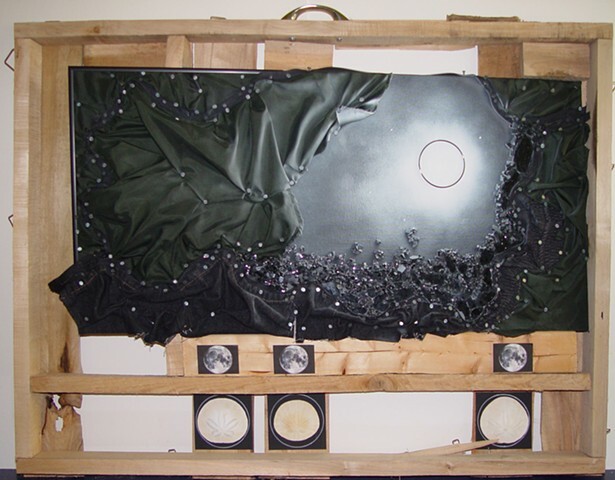 Mixed Media: fabric, carpet tacks, spray paint, plastic ring, zippers, NASA moon image on panel. 28 x 35 3/4 x 3 3/4"